Using satellite photos of a giant twister-like dust devil on Mars, scientists have created a 3-D video model of the column to study weather patterns on the Red Planet. The video is based on a photo captured Feb. 16 by NASA's Mars Reconnaissance Orbiter, which has been circling our neighboring planet since March 2006. 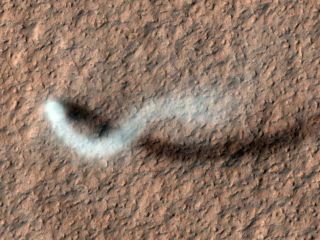 The image shows a smoky white swirl representing a 100 foot-wide (30 meter) Mars weather phenomenon that kicked up a column of dust half a mile (800 meters) up into the planet's atmosphere. By studying the shape of the Martian dust devil as well as its shadow, researchers at NASA's Jet Propulsion Laboratory (JPL) in Pasadena, Calif., which manages the Mars Reconnaissance Orbiter, determined that the column extends high into Mars' atmosphere. The whirlwind was spotted in the Amazonis Planitia region of northern Mars by the orbiter'sHigh Resolution Imaging Science Experiment (HiRISE) camera. "These areas are volcanic plains, covered with dust, and this season is northern spring on Mars," Richard Zurek, Mars Reconnaissance Orbiter project scientist at JPL, said in a video showcasing the model. "At this time, the ground's getting hot, and when the ground gets hot, it can produce dust devils." Dust devils are spinning columns of air that pick up dirt from the ground, making them opaque. As the sun heats the ground, it warms the air just above the surface, causing it to rise through the pocket of cooler air above it. If conditions are right, this warm air may begin to rotate into a twisting column. Dust devils are different from tornadoes, which are generally more intense and form as part of a storm, whereas dust devils occur in clear weather. The HiRISE team was able to use the satellite's still photos to get a 3-D view of the whirlwind. "From that image, we can reconstruct what that image would look like if we were able to get an oblique view, as if we were in a helicopter flying around the dust devil," Zurek said. "The streak on the surface, the dark band, is actually the shadow. That's where they get height." The height of this dust devil is comparable to the largest ones on Earth, Zurek said. Note: This story was updated to correct the price of the Mars Reconnaissance Orbiter.